Check out these beach houses and their one of a kind interior designs. Vacation homes can have some the most extravagant interior design styles. The proximity to the beach can serve as inspiration to create a tropical paradise or a relaxing retreat in your own home. Beach house interiors feature everything from stained glass windows to monochromatic rooms. Let these incredible beach homes serve as inspiration for designing your own getaway! 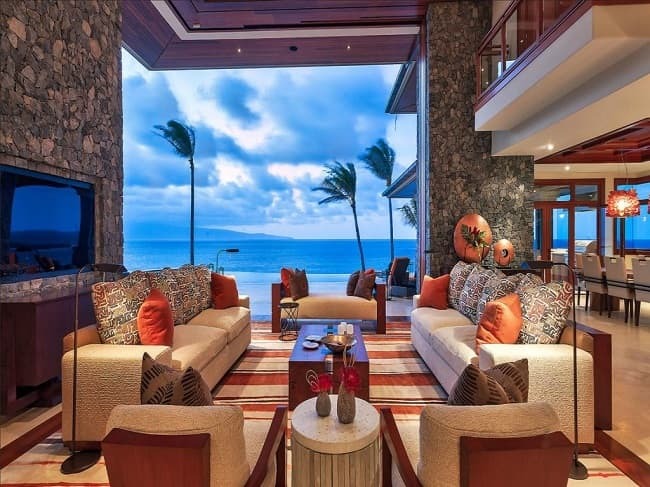 This beach house is the epitome of luxury. The rich color of the wood floors is pulled in through the staircase and the exposed ceiling support beams. You can see the homeowner’s mementos from travels abroad throughout the home adding an eclectic touch to the home design. The stained glass gives the otherwise neutral space pops of color. This homeowner also took advantage of their beachfront property by installing a disappearing wall. When the weather is nice, they can slid the glass wall into the home and makes the living space an indoor outdoor hybrid area. Beach home décor doesn’t have to feature bright colors and an island theme. 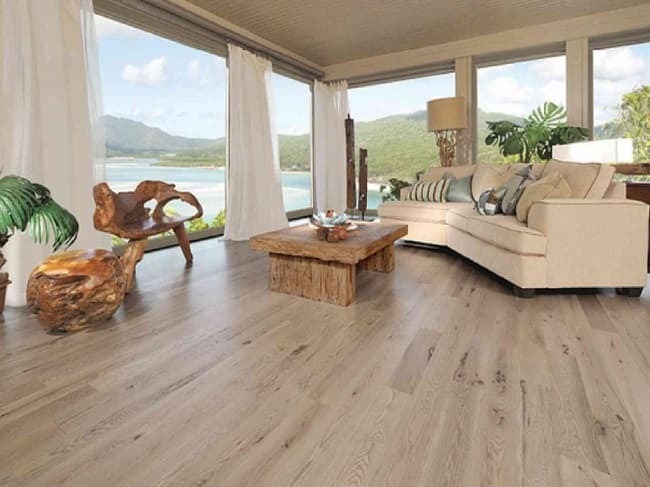 This living room utilizes the relaxing laid back nature of coastal areas. The centerpieces in this room are the natural wood furnishings that would read as rustic in another home. However, in this beach house, they are used as a connection to the house’s surroundings. They also bring warmth to the room that is mainly full of light beiges. 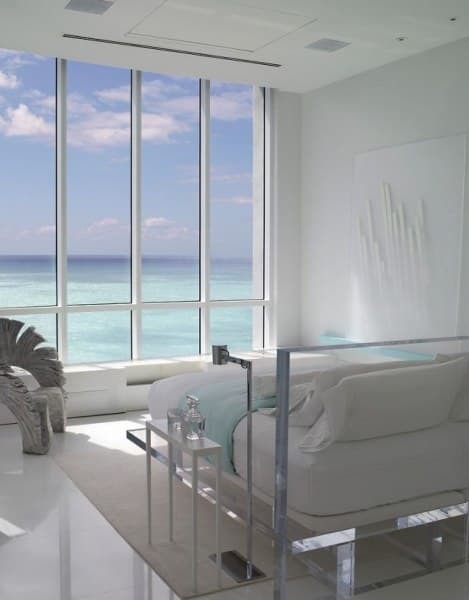 The large windows allow a lot of light in and an uninterrupted view of the beach. By choosing light and airy curtains, the homeowner can keep the bright openness in the room even when they’re closed. Pops of color are brought in the pale pastel throw pillows and vibrant plants around the room. 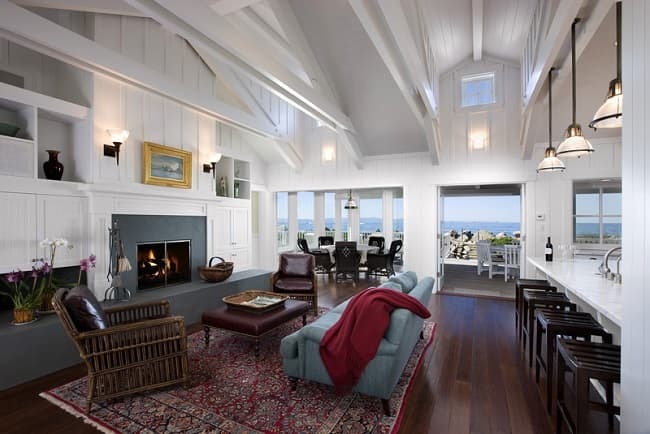 This living room is another example of how rustic design elements can be used in an open beach house. The stone walls paired with rich wood tones would usually be featured in a cabin or lodge. However, this home has the aesthetic of a chic island home. The home has an open floor plan with an overlook from the second floor. The homeowner keeps the room from feeling heavy by using light colors in all of the upholstery and floors. 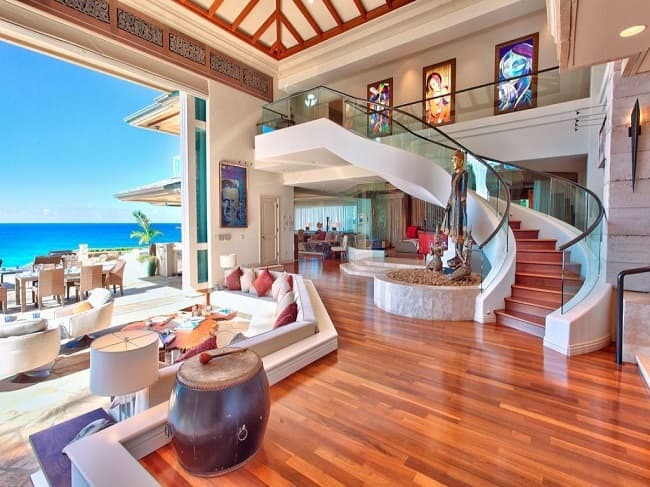 You don’t have to have an extravagant beach house for an incredible interior. This home has more of a traditional design aesthetic. The homeowner has an all-white ceiling with exposed beams and white walls. This opens the space and makes it feel larger. The exposed beams in the middle of the room are a dark color to fit to match the floor and fit in with the warmer colored furnishings. The window accentuates the peaked ceilings and is accented by a natural wood frame. This home also shows that you don’t need a full disappearing wall to enjoy the outdoors. Their accordion balcony doors leaves a large open space to combine the two areas. This dining area has a traditional beach house color story with crisp whites and soft aqua tones. There is a lot of contrast between the all-white walls and the dark grey tile flooring. Reclaimed wooden beams are used to contrast the white bead board ceiling, as well as create a subtle separation between the kitchen and the dining area. The wicker furniture fits into the laid back design aesthetic that the homeowner has created. Bright colors are brought in through the bright bar stools and countertop pieces. 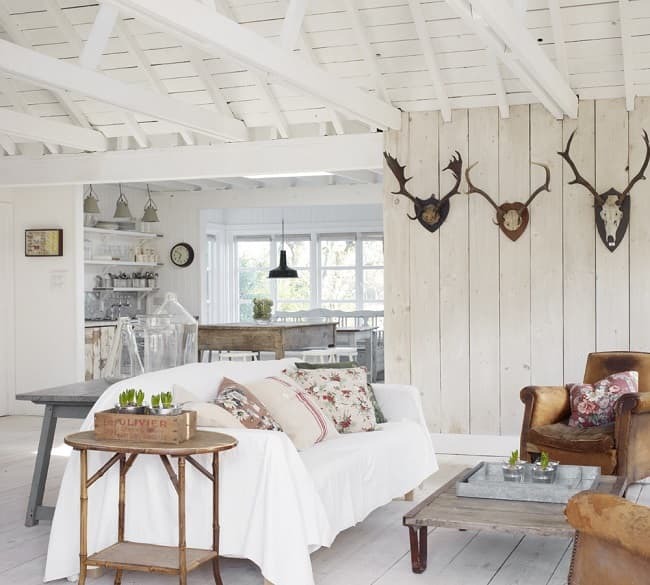 This beach house the charm of a quaint country cottage. 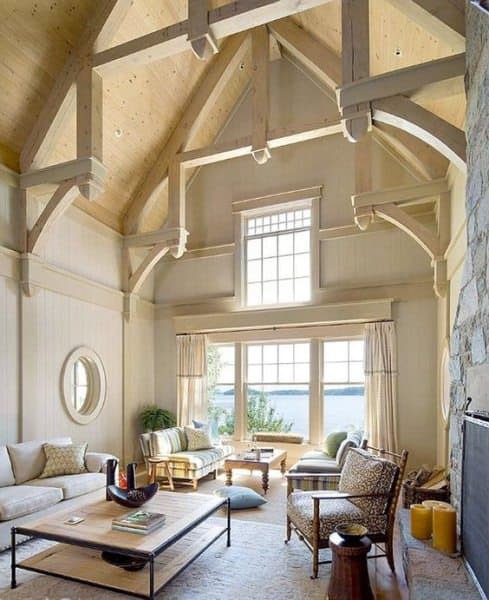 The white ceiling and support beams are offset by slightly warmer beige bead board walls. There is minimal decoration around the room, but life is brought into the space through the distressed leather armchairs and reclaimed wood coffee table. The side table uses a traditional beach house material, bamboo. The large glass jugs on the farmhouse table behind the couch add an interesting visual element without adding large bulky items. There is an ease to this space that isn’t overdesigned, but it still has the perfect amount of polish and finish to tie all of the elements together. This tiny beach house has a fun and clever interior design style. The homeowner made the most of the vaulted ceiling by using the open peak as a bedroom loft. The port window lets some light into the small area. The ceiling and walls are all white, keeping the space bright and feeling more spacious. The floor is kept a dark neutral for a contrast. Bright greens and blues are pulled in through different furnishings that have a minimalist design. This keeps these bright colors from feeling overwhelming. This beach house bedroom is the definition of a minimalist interior design. Beach house interiors can be modern and simplistic without being bare. This homeowner used an all acrylic bedframe that is completely transparent. The side table is a thin metal frame. Both of these designs play supporting roles rather than being the centerpieces of the room. There are small color accents in the throw blanket and the shelf on the far wall. They mirror the color of the ocean that is right outside the floor to ceiling wall. The artwork on the wall is monochromatic and adds interest through texture rather than bright colors. This beach front cottage uses the home’s original architectural elements to create a unique space. The exposed support beams frame the room and keep it cozy rather than a large open space. The homeowner chose a ladder as their loft stair option. The support beams, walls, and ladder all feature a grey wash finish that gives the room a rustic look. To keep the room from being too heavy, the homeowner chose to use white linen slipcovers over the furniture. Color is pulled in through the accent pillows. This modern beach house kitchen has pops of color throughout different aspects of the room. The homeowner kept the walls simple with white subway tile that add interest through texture rather than bright colors. The soapstone counters are a neutral grey that match the range hood over the stove and the support beam. 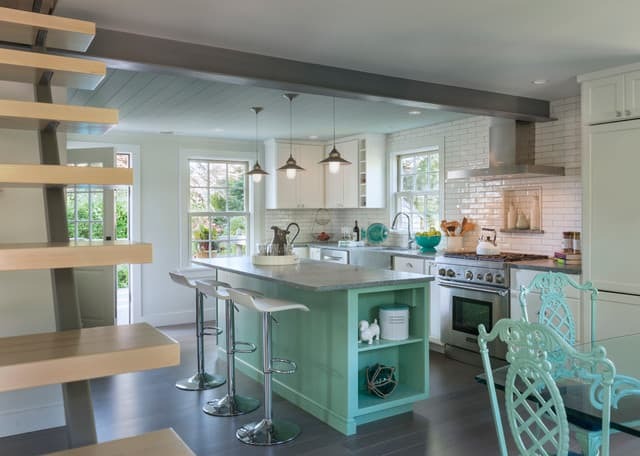 The base of the island, dining chairs, and serving dishes are all a bright teal color. This is a common color option for beach house interiors because of its promotion of rest and relaxation. This beach house entrance hall is bright and clean with just the right amount of fun. The tile is a classic design that doesn’t deter any attention away from the bright pops of blue around the room. The muted grey walls have paneling that keeps them from looking flat and boring. Beach house interiors can be more fun than you’re standard home design with a little bit of self-awareness thrown in. This home plays to the idea of being close to the seaside with its design accents. 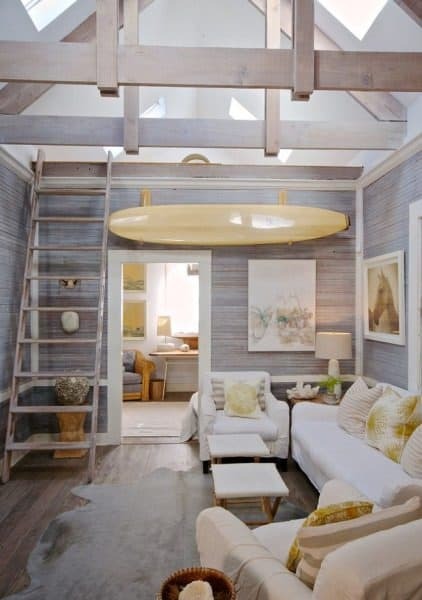 The surfboard pulls in the blue accents and the staircase is lined with framed vintage bathing suits. If you look closely, you’ll see that the unique light fixture is actually a school of fish! This beach house takes some pieces of classic beach house interiors and pair them with traditional home design. The white bead board walls and light grey ceiling keep the coastal home light and airy. The rich dark wood floors and ornate area rug give the room more warmth. This pairing can be seen in the furniture as well. The wicker frame armchair frames and dark leather cushions also show the combination. This open plan living room has plenty of storage with built in cabinet systems and open shelving around the fireplace. The storage solutions are seamlessly worked into the room by keeping them the same color as the rest of the walls. This keeps the room from feeling cluttered. 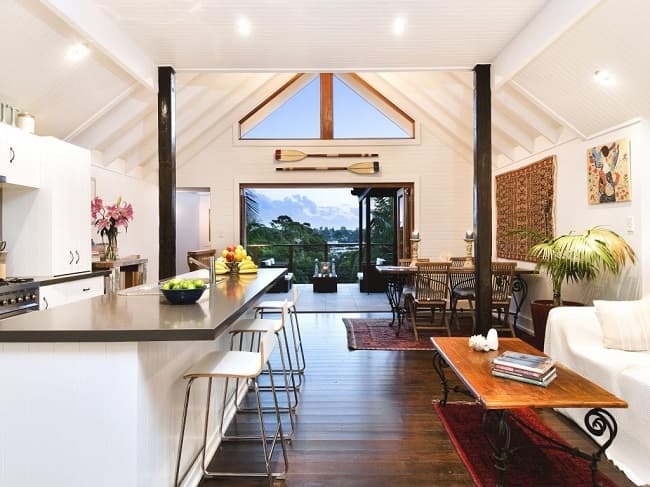 This rustic open plan kitchen features interior design that incorporates the ease of coastal living. 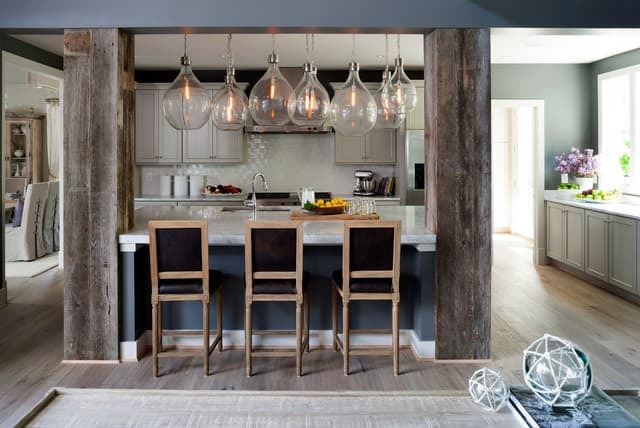 The large weathered supports bookend the island and create a frame for the light fixture. This centerpiece takes an industrial element, the Edison bulb, and takes it to a new level with an oversized design. The minimalist design keeps the piece from being overbearing in the otherwise simple space. The cabinets are a cool beige that complements the dark charcoal island and ceiling beam. The floors are kept a light neutral with white washed wood floors. This beach house doesn’t shy away from rich and bright colors. The vibrant royal blue couch is the centerpiece of this otherwise neutral room. The colors is pulled into the room by the ottomans underneath the table and the chairs across the room. The pattern keeps the blue from being overwhelming by pairing it with neutral colored stripes. A lot of visual interest is brought into this living room through texture. The ceilings exposed beams accentuate the center point of the roof. The fireplace wall has a subway tile treatment that is trendy but simple. The large windows open the space up for more natural light flow. This room is designed around the concept of openness. The window lined walls allow lots of fresh air and natural light into the home. 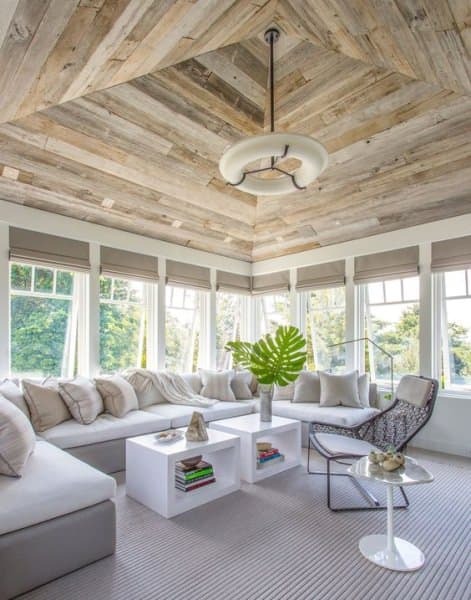 The mismatched wood board ceiling adds a natural element to the room, while the furniture is very minimalist in design and color. There is no embellishment in the frames and the colors are kept to grey tones. There is one pop of color with the table top plant in the center of the room. This beach house bedroom was inspired by tropical getaways with simple rooms. The all white minimalist design is contrasted with the deep brown color of the shutters and doors. The ceiling uses exposed beams to add texture to the monochromatic surface. A singular accent pillow makes a statement on the bed with the rich blue color. The white curtains around the bed add softness to what can be a harsh color. 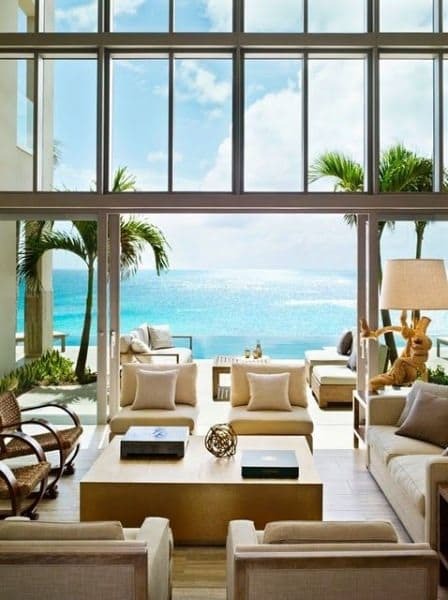 This beach front home takes advantage of the view with a full glass wall. Between the sliding doors and the large windows, the living room is completely open to the beautiful outdoors. The homeowner kept all of the furnishings neutral in the room, leaving the palm trees and ocean as the only pops of color. The sand colored upholstery accents the bright greens and blues perfectly. They also chose to keep the indoor and outdoor furnishings in the same style. By matching them, the spaces can become one when the doors are open. This seaside home used the ocean as its inspiration for this room. The nautical living room features different ship pennants as artwork across the top of the wall. The navy and white furniture is a classic nautical color scheme. But the show stopping piece is clearly the large boat that was repurposed as a central light fixture. The shape of the upside boat mirrors the bow of the ceiling and the shape of the adjacent windows. The colors of the boat also tie together the light wall panels and dark floor and ceiling colors. 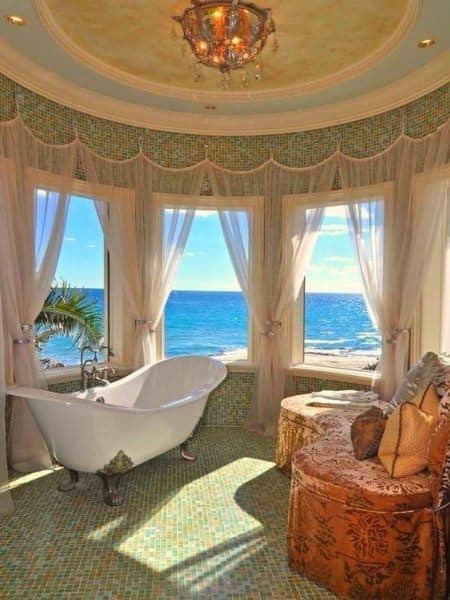 This bathroom is fit for a coastal castle. The multicolor tiles uses colors that are naturally found in the ocean, greens and blues, and ties in the bench with spots of orange. The velvet skirted bench with rich color throw pillows transports the room to an exotic port rather than a traditional seaside town. The claw foot tub and chandelier add the extravagance of the room. The windows that line the walls give an uninterrupted view of the bordering ocean. This home features incredible architecture as the defining part of the interior design. The exposed supports aren’t the traditional straight beams, but rather cathedral like supports that are heavily designed. The windows mirror this same shape with their pyramid like stacked design. The height of the top window allows for the maximum amount of natural light to enter and fill the room. The color scheme of the room is kept light and neutral with dark accents in the furniture frames. All of these beach houses feature some incredible architecture and interior design. One of the key features shared by all of them is their incorporation of their settings into their designs. 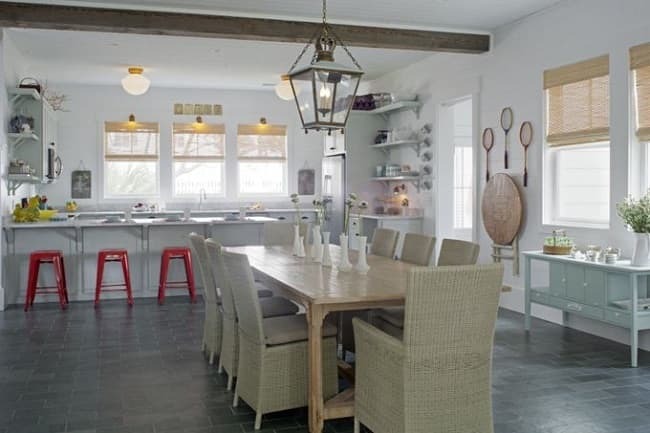 You can take these beach house interiors as inspiration for your own home! While you may not want to have a coastal design style, you can take small hints of that relaxed style and incorporate it into your living space.